The band was formed in 1996 as Alter Ego and issued three demos before signing to Pulverised Records in 2009. Agnarr joined at this time. Balfor lost guitarist Agnarr in 2010. He had to quit the band because of an injury that hindered the guitarist from performing. Dragon-T, formerly of thrash metal band Hell:On, was the replacement for Agnarr. Ukrainian black metallers Balfor issued the debut Barbaric Blood through Pulverised Records. Designed by Martin Saavedra at Uruguay's Spina Studio, Barbaric Blood was recorded at Blacklight Studio, Ukraine in August 2009 and mixed and mastered by Shaddar. The band signed with Drakkar Productions in 2016. A new album was to be released early in 2017. Athamas was on bass. Astaroth was on guitar. 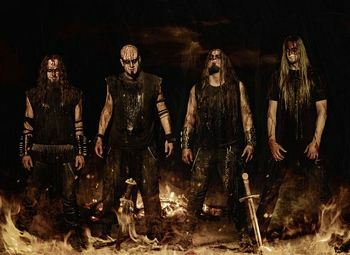 Ukrainian black metal band Balfor, which had announced signing with French black metal label Drakkar Productions, announced a forthcoming album entitled Black Serpent Rising. The Black Serpent Rising’s artwork was created by Ukrainian artist Nurgeslag (Rotting Christ). Ukrainine-based band Balfor would tour across Poland, Czech Republic and Slovakia together with Degoryen, Raventale (featuring Astaroth) and Vrani Volosa in May 2017. Venom, My Dying Bride, Ghaals Wyrd, Darkane, The Great Old Ones, Diabolical, Balfor, Mortal Strike and Haunted were added to the line-up of Eindhoven Metal Meeting 2017. The ninth edition would take place on Friday 15 & Saturday 16th of December. Balfor means 'funeral fire.' This band should not be mistaken for the Russian one with the same name.